Worried about finding enough money to buy a new inner tube for his bike, a twelve-year-old boy gets an old riding mower from his grandmother for his birthday. 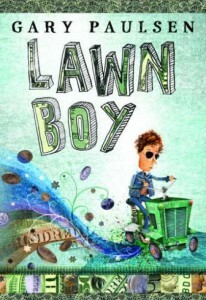 Soon he is mowing his neighbors’ lawns, and making more money than he thought possible. When he meets Arnold, a stockbroker who teaches him about managing money, investing, growing a business, and the brutal ups and downs of the marketplace, things really get going. Eventually, our narrator discovers that having a lot of money doesn’t mean that your money problems go away—you simply exchange them for a different set of problems. More importantly, it is not the amount of money you have that determines your happiness, but the people you surround yourself with. First, a confession: I have not read a lot of Gary Paulsen, apart from Hatchet and Brian’s Hunt, excellent books which celebrate a sort of rugged individualism that is popular with certain political movements at this time. However, I was intrigued by the quirky cover illustration (by Pablo Bernasconi), which is very different in tone and style from the various Hatchet cover illustrations I have seen over the years. It seemed at odds with everything I’ve assumed about Gary Paulsen. So when I picked up this book, with Gary Paulsen’s name on the cover, and opened it up, discovering chapter titles such as “The Laws of Increasing Product Demand Versus Flat Production Capacity” and “Overutilization of Labor Compounded by Unpredicted Capital Growth” (which sound like chapter titles from a book on economics or business mangagement, rather than a chapter book aimed at ten-year-olds), I assumed, based on my admitedly tenuous knowledge of Gary Paulsen’s oeuvre, that this book would be a conservative polemic advocating capitalism, “free” markets, and zero regulation. I was pleasantly surprised to find that I was wrong, however. Well, half wrong. Warning: The rest of this post contains spoilers! To be certain, our unnamed narrator (my only real bone of contention with the book, since the lack of a name means you must constantly refer to the “unnamed narrator”) does experience the thrill of making successful business decisions. He takes an unusual and unexpected gift and parlays it, in a very American way, to his advantage. He is so successful at mowing lawns that he must subcontract some of his work to people who just might not be in this country legally. He is constantly reminded by Arnold about the difference between gross and net and the obligation even twelve-year-olds have to pay taxes. He is aware that his success is due to a combination of his own initiative and the cooperation and loyalty of those that are working with him or for him. In a way, you could argue that this book espouses certain conservative economic policies and you would be right. You could also argue that this book espouses certain liberal economic policies, and you would also be right. There are threats and intimidation from not-so-legitimate competitors, secrets being kept from parents, and numerous other examples of questionable behavior. But whether you view it as liberal or conservative depends on the viewpoint you bring to it. This book doesn’t make a judgment either way. To be sure, this book does raise issues about labor, illegal immigrants, and the nature of the employer-employee relationship, as Noelle on GoodReads points out. However, while she finds the raising of these issues problematic and a reason to put this book aside, this is actually an opportunity to discuss these issues with kids. I will say more about this sometime soon, I reckon, but I don’t mind repeating myself. The purpose of literature is to entertain, not to tell us how to live. The most that literature can teach us is how to think. You can read this book and be entertained, as I was, or you can read this book and come up with some new thoughts and viewpoints about these issues. But you can’t read this book and come up with a definitive answer one way or the other from Mr. Paulsen. He wrote this book to entertain, and if he really wanted a message to be the central point of this book, his manuscript could have fit on a postcard. This book is really about fantasy, plain and simple. How likely is it that a twelve-year-old could turn a $35 into nearly half a million dollars? Not too bloody likely. Any person who’s ever filled out a job application, whether they’re twelve or twenty-four, has imagined themselves spending far more money than they could ever possibly earn from said job. The concepts of money, value, and worth are slippery concepts at best, and in our post-modern age, they have become even more slippery. We dream about what we would do if (no, when) we win the lottery, or strike it big at the casino, or get our annual bonus. In the end, this story is a fantasy about training hard, defeating the dragon, and getting his treasure. If you want to read conservative political and economic messages, or liberal political and economic messages into this book, you certainly can, and nobody’s going to stop you. Like I said, this book doesn’t have a message. Whatever message you get out of it is one that you brought with you. And he had a wide, wild tie and a kind of sport coat that looked suede but was cut with wide lapels and shoulders and a narrow waist that didn’t look too good on his round body. He looked like somebody who had flunked clown school. It was hard not to smile. Turtle or rabbit is a good metaphor for voice in kid’s books—you either get it right or you don’t, and there is precious little in between. Our narrator is judging Arnold on his appearance, and at the age of twelve, he’s just around the age when kids start to do this professionally. As for the line “someone who had flunked clown school,” well, you’d have to be either a twelve-year-old or a stand-up comedian to come up with that one. Ages: 8-12. Recommendation: An engagingly funny and thought-provoking read.